Spiral Fin coils are used for heating, cooling and dehumidifying. 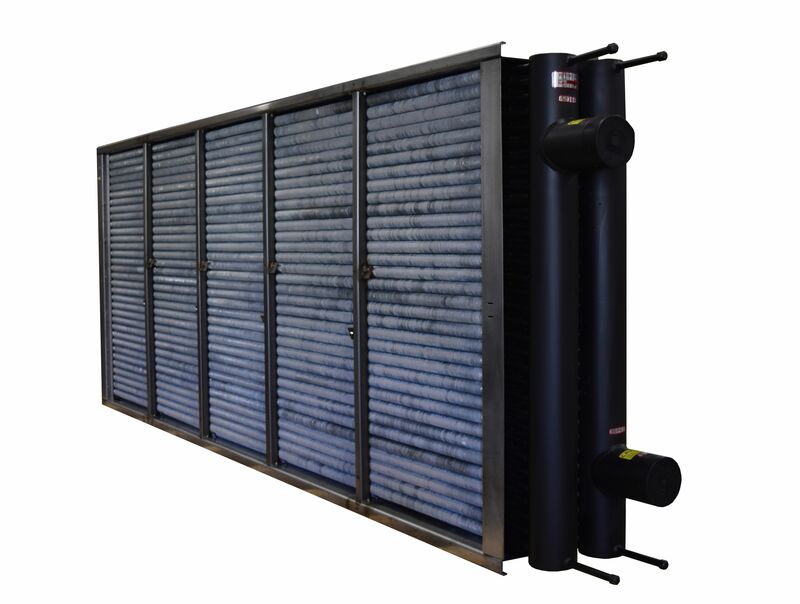 In addition to water, a variety of other heating and cooling media, such as glycol and brine solutions, thermal oils, and refrigerants for DX applications, can be used. Aerofin Spiral Fin coils feature fins of aluminum, copper, stainless steel or carbon steel. The fins are tension wound onto individual tubes to minimize thermal contact resistance and air friction. Tapered fin design provides maximum fin-to-tube contact for optimum heat transfer. Individually finned tubes allow unrestricted movement of the tubes, eliminating stress on the tube and fin to tube bond caused by thermal cycling. Material thicknesses on the fins can range from 0.010” to 0.030” depending on the material being used. 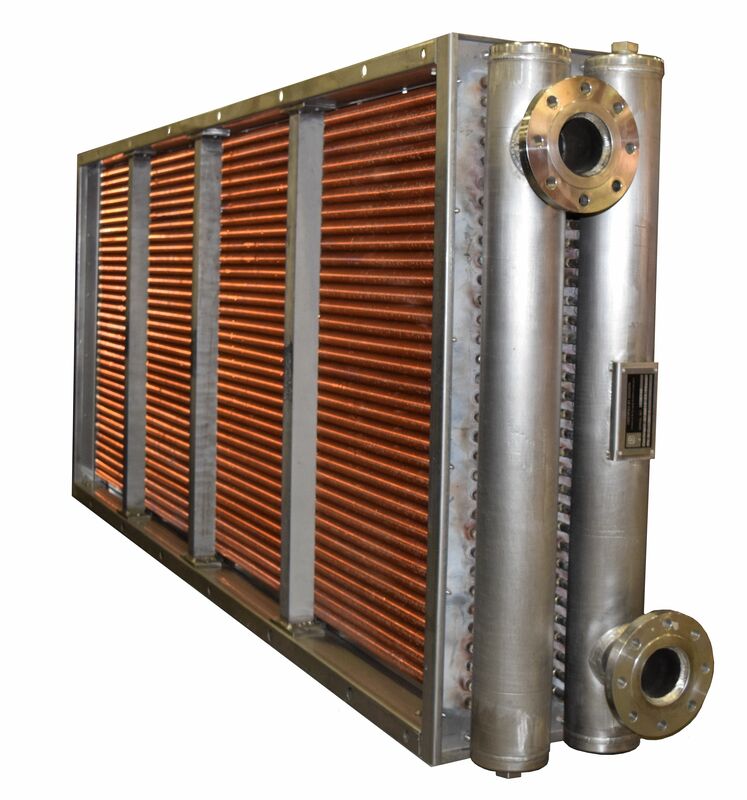 All coils feature 5/8″ OD or 1″ OD seamless copper tubes conforming to ASTM specifications. Standard 5/8″ OD tube wall thickness is 0.020” and standard 1″ OD tube wall thickness is 0.035”. Heavier wall tubing is available up to 0.065” for 5/8” tubing and 0.134” for 1” tubing depending on the material being used. Copper-nickel, aluminum, stainless steel, and carbon steel are available material options. Aerofin has a variety of methods for our tube joints. All copper based tubes are brazed with certain applications such steam heating coils using silver braze. Other tube materials, such as stainless or carbon steel will require welded joints. Coils featuring removable or box style headers will feature roller-expanded tube joints. Aerofin brazers and welders are ASME qualified. Coil casings are heavy gauge galvanized steel for high strength and durability, and as a standard are double flanged for coil stacking. Stainless steel, aluminum, and other casing materials are available material options. Special configurations such as welded casings for airtight applications are available. Aerofin’s standard coil test is performed with 300 psig air under water; however, some types of coils may require different testing parameters. Coils with removable headers will be tested hydrostatically to 150 psig. Higher design and test pressures are available for special applications.